Did you guess it? 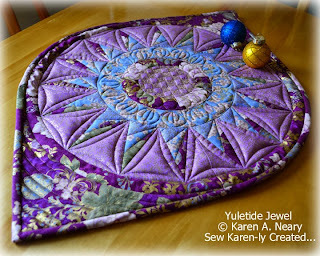 It's Yuletide Jewel, (Pattern 109) one of my very favourite designs. Yesterday I showed you the quilting threads I chose. For the continuous curves around the spikes, I used a matching Sulky rayon. The centre cross-hatching uses gold metallic thread; micro-stippling in every other grid section gives great texture. 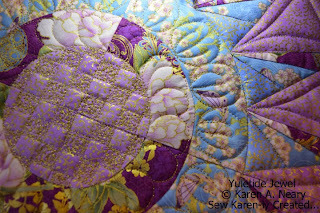 Circles were quilted in the wide blue band, and then 3 sprays added to each. 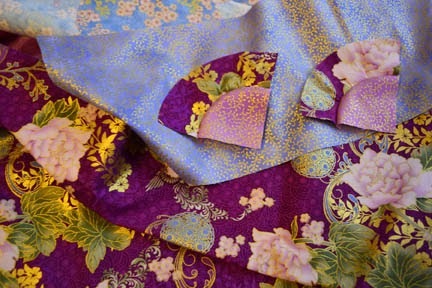 Last week I showed you some gorgeous Hoffman "Asian Peony" fabric I picked up at Mrs. Pugsley's Emporium. 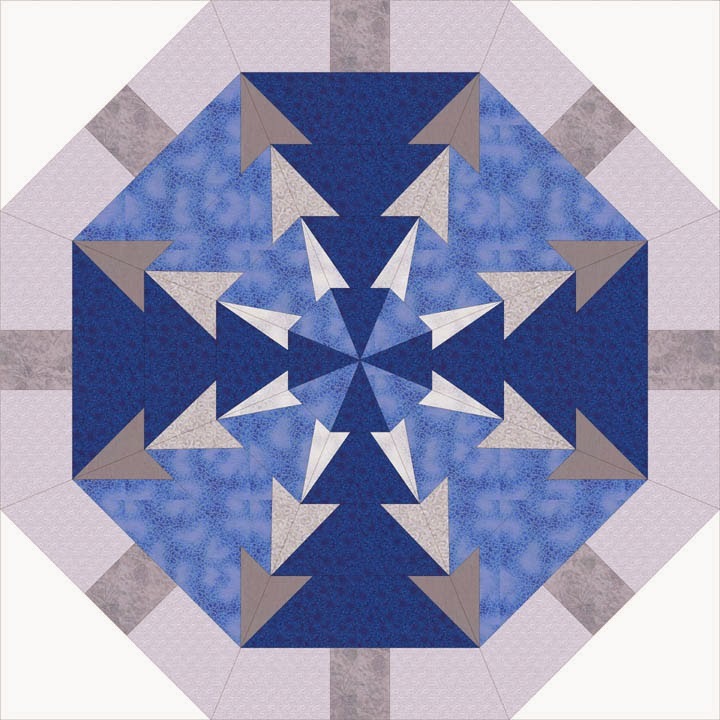 Sewing my favourite New York Beauty blocks has been so much fun. 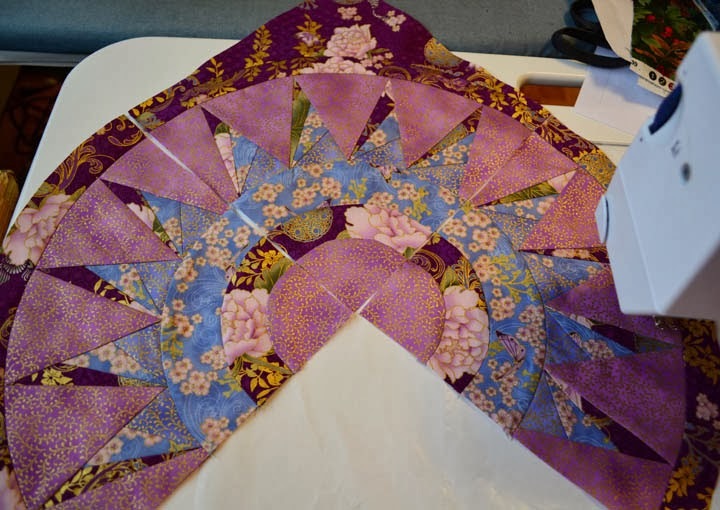 Do you recognise the pattern I am making? It only has four blocks so I am almost finished. 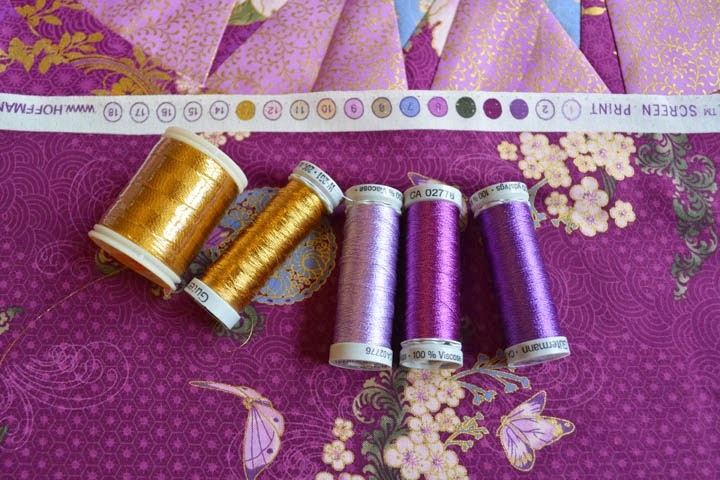 The dots of colour on the selvedge help with thread selection for the quilting. The fabric sparkles so I also chose threads which do. 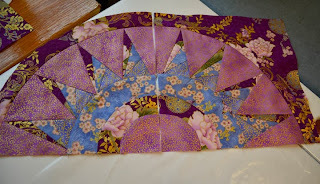 I am off to quilt; hopefully tomorrow I can show you the finished project! 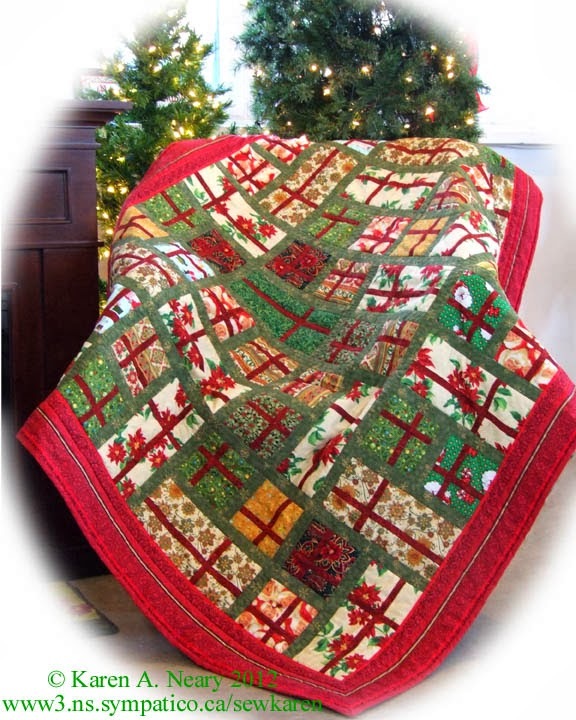 Last year I designed this fun Christmas quilt and offered it via download through Craftsy. I've since heard from many who would prefer a printed version. So, here once again is Gift Scrapped, this time in a more traditional format. You can read my original post on the quilt here. 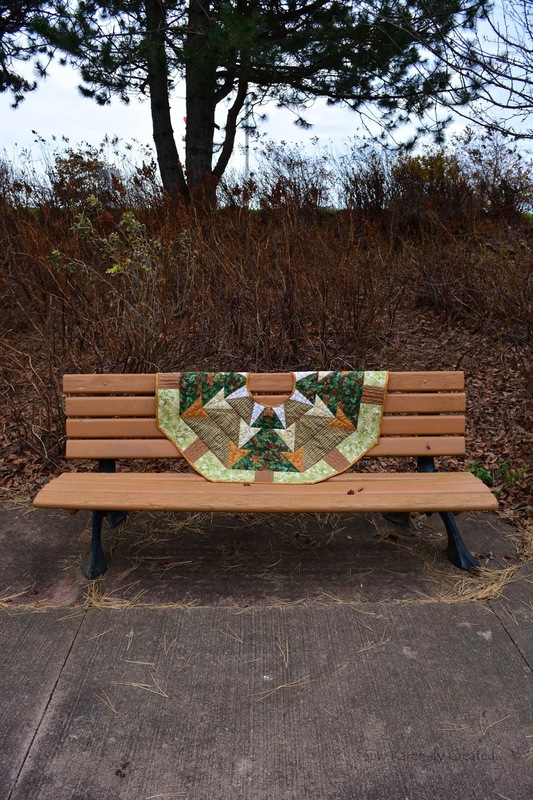 The pattern, which includes directions for a lap quilt, table runner and placemats, is available for purchase through my website, or locally at Mrs. Pugsley's Emporium. And if you are more of a digital devoteé, it's still available on Craftsy as well! 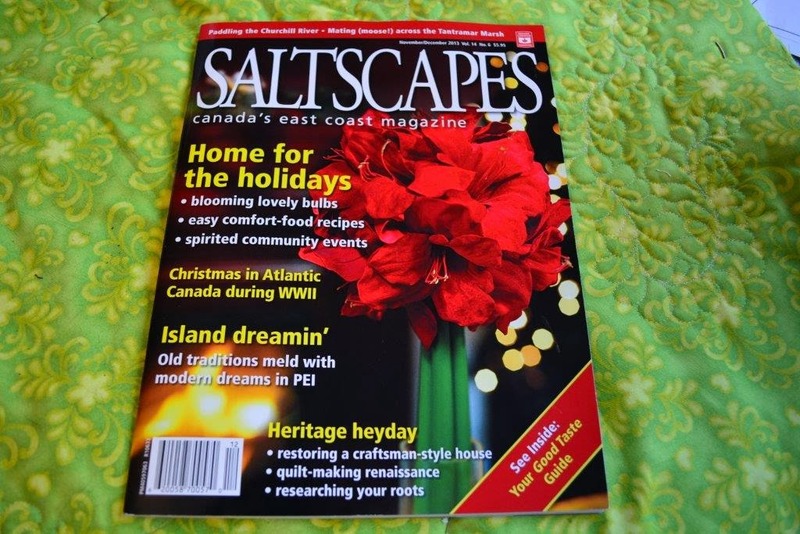 What a thrill to open the new (Nov/Dec 2013) issue of Saltscapes magazine and see my Clare quilting friends profiled! The article by Marjorie Simmins entitled "A Stitch In Time" looks at the long quilting tradition in Clare, Nova Scotia and at the amazing work being done by La Guilde Acadienne de Clare. Not surprisingly, guild founder Joan Tufts is pictured and quoted extensively. 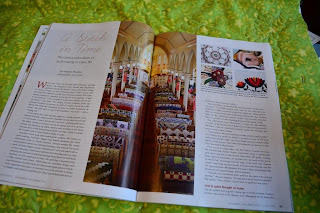 I had the pleasure of attending this spectacular show at Saulnierville's Sacre Coeur church last summer; you can read my blog post here. 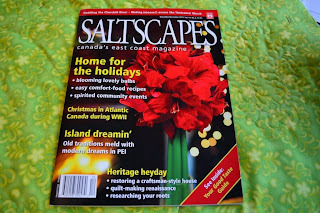 Fittingly, the magazine issue also includes an article on "An Acadian Christmas" with some pretty tasty looking recipes. 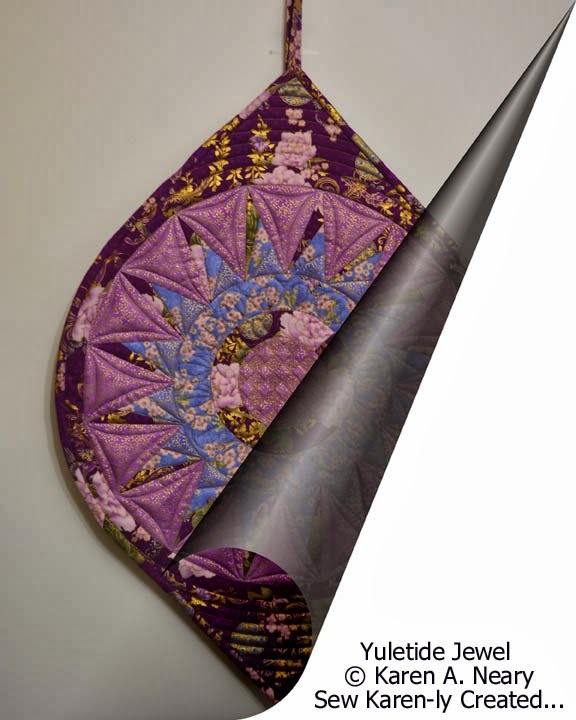 Congrats to La Guilde Acadienne de Clare for all the wonderful work they do to promote and encourage the tradition of quilting in the Maritimes. The new pattern for Woodland Tree Skirt is finished and the instructions are ready and waiting to go out to you. 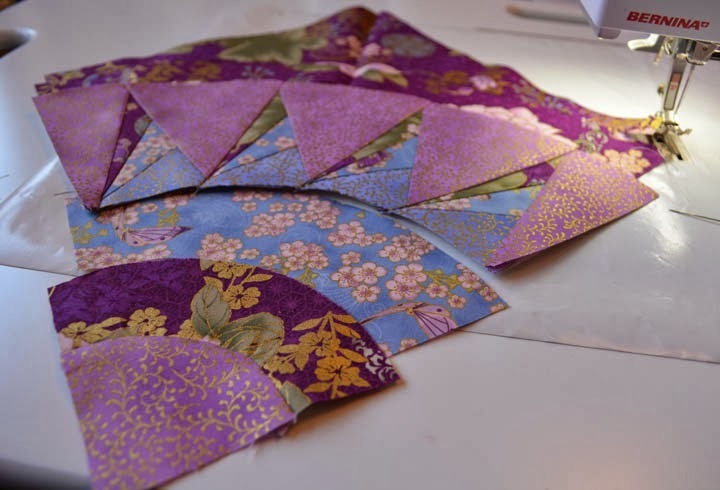 It is super quick and simple, with large pattern pieces and all straight seams. 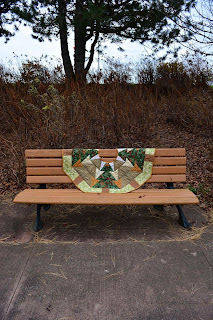 It began with the notion that I wanted to sew something new for Christmas, something fuss free. I sketched it out first in blue and silver; an angled edge on each tree creates a dynamic secondary design where the seams connect. I love how the silver points look like frost. 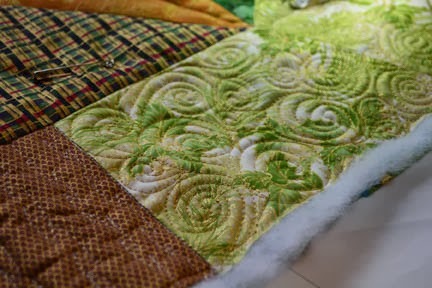 When it came time to sew however, I found myself gravitating towards more earthy, traditional tones of green and gold. 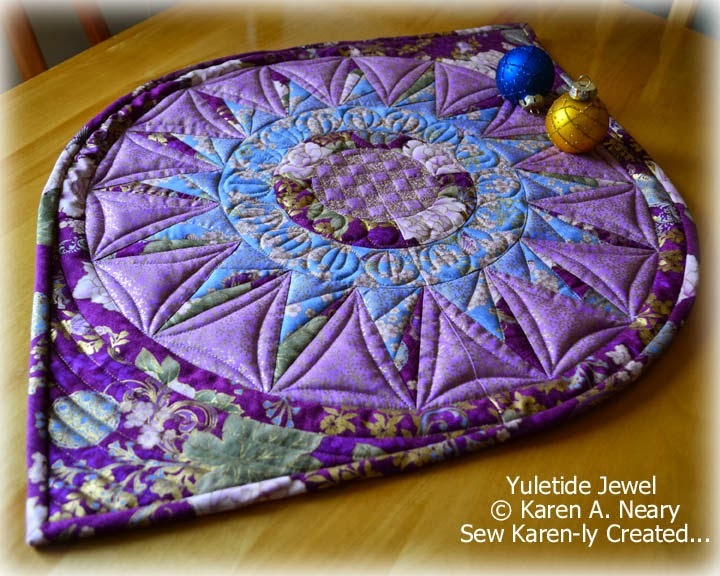 You can use it for a table topper as shown in the blue sketch, or easily leave out the top tip of the tree for a centre opening on a tree skirt. It finishes to 40" across, but is easily made larger by adding an outside border. Three little snaps hold the skirt closed. The pattern is being offered for sale in two formats: a regular printed pattern for $12.95, or as an instant pdf download through Craftsy for $9.00. 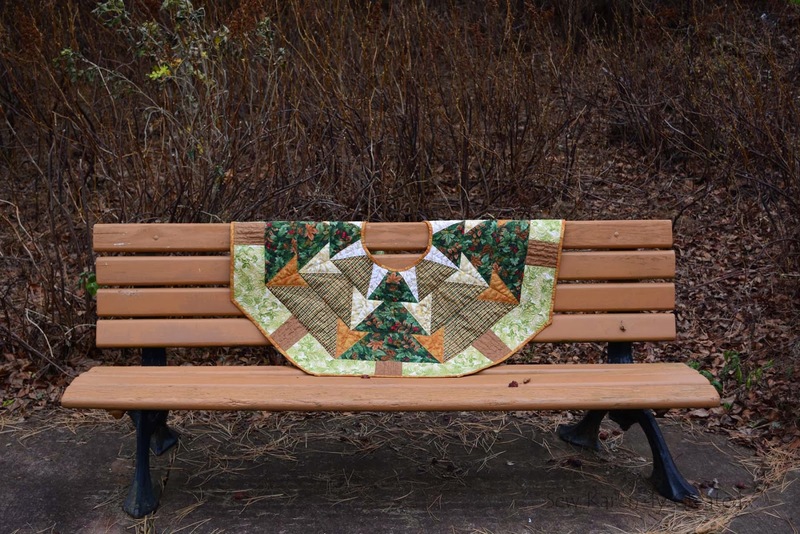 If you purchase through Craftsy, that price includes all taxes and delivery is immediate to your computer so you can start stitching right away. 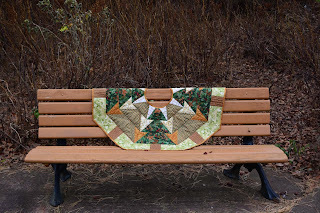 If you have never used Craftsy before, there is no cost to join and it's a very simple process. 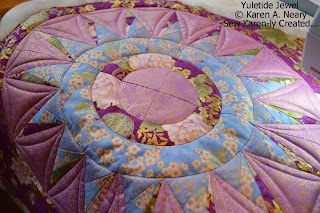 Locally the pattern is available at Mrs. Pugsley's Emporium, or directly from my website. This has put me in the mood for more Christmas projects; I never tire of sewing Christmas! After such a lapse in blogging it's hard to know where to start again...with apologies, explanations, or pages and pages recapping all that's happened in the interim? It's best perhaps just to give a nod of acknowledgement to the difficulties of the past few months, and start back in. We can kid ourselves into believing we are in control of our lives but all it takes is one hard knock to remind us otherwise.. So now it's time to get myself back on track and do some fun things. I've been itching to get some of Mrs. Pugsley's gorgeous fabrics under my needle so I made a beeline for her Christmas prints. 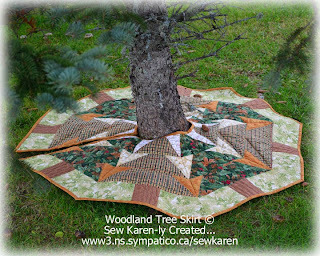 I designed a super simple Christmas tree skirt, the pattern for which will be available very shortly. It went together like butter and I can't wait to share some more pictures with you. And then - because it's absolutely no fun just to work on one thing at a time - I started in on this gorgeous Asian Peony collection by Hoffman. 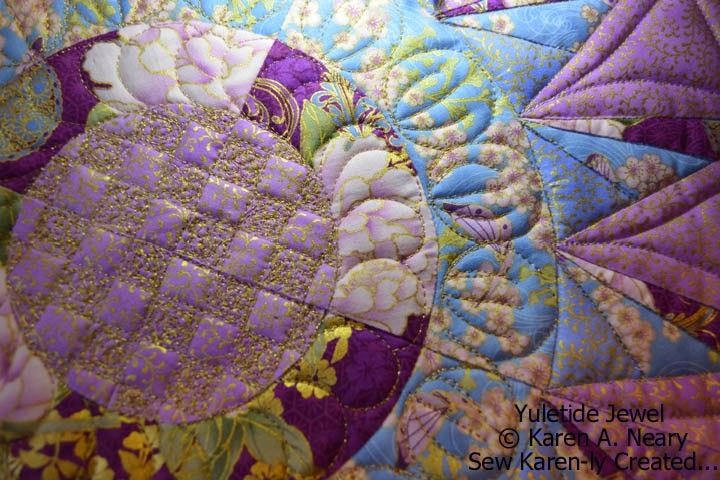 I love the gold sparkle in the fabric; it's like stitching a Paragon china tea cup. Sandwiches, douceur, thé. café/ sweets, tea, coffee. Billets/Tickets 5,00$/ $5.00 à la porte / at the door.